In the first edition of the ICC cricket World Cup, the ‘Black Cat’ and his men were unstoppable. In fact, it was Clive Lloyd, whose counter-attacking 102 off 85 balls set West Indies on the way in the final to 291 in 60 overs. 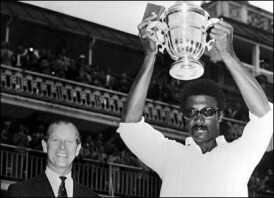 A young Viv Richards scored three run-outs to derail the Australian retort and the West Indies won by seventeen runs to win the first World Cup. It was the West Indies again, who clinched the second edition of World Cup. The unstoppable Vivan Richards hit an unbeaten 138 as the West Indies posted 286. Geoff Boycott and Bearley took almost 40 overs for their opening wicket partnership of 129. Joel ‘Big Bird’ Garner took five as England folded out for 194. One of the upsets of cricketing history, if not the sporting history. Rank outsiders, India were bowled out for 183 in the final by a West Indian bowling line-up, which consisted of Andy Roberts, Malcom Marshall, Joel Garner and Michael Holding. Looking at the pace quartet, Kapil and India would have taken 183. In a ‘nothing to lose’ situation, Kapil’s Devils bowled the West Indies out for 140 to put India on the cricketing map. For the first time, the World cup moved outside England and the number of overs were reduced from 60 to 50. World champions, World Series champions, hosts and hot favorites, India, went out in the semis to England. Chasing Australia’s 253 in the final , Mike Gatting’s infamous reverse sweep triggered a collapse as they lost to the Kangaross by seven runs. The tournament saw colored clothing and day-night games for the first time. Pakistan would have gone out had rain not intervened in the 13th match of the tournament against England. As history has it, they went on to beat England in the final by 22 runs. Young Wasim Akram came round the wicket to pick two in two to seal England’s fate to another defeat in a World Cup Final. Sri Lanka shocked the world, first with their ’15-over tactics’ and then going on to win the world cup. Jayasuriya and Kaluwitharna set the tone and typified Sri Lanka’s apprach in the world cup- fearless, aggresive and nothing-to-lose. Ashanka Gurusinha, Aravinda De Silva, Arjuna Ranatunga, Hashan Tillakratne and Roshan Mahanama gave the middle order more than just a solid look. If Jayasuriya and Kalu failed, as they did in the semi-final against India, Aravinda would counter-attack and the rest would play around him. Vaas, Wickramasinghe, Murali and Dharmasena, supported by the likes of Jayasuriya and Aravinda formed pretty much the ideal bowling line-up for the sub-continent conditions. They went on to beat Australia in the final by seven wickets, the first time a team batting second won the final of a world cup. In the first “non-world-cup” ICC tournament, Jacques Kallis inspired South Africa to a five-wicket win over the West Indies in the final. The young all-rounder from Cape town took five for 30 and then scored 37 to set the Proteas on the way to victory after Philo Wallace had scored a blazing 103 off 102 balls. Earlier, in South Africa’s semi-final encounter against Sri Lanka, Kallis smashed 113 (5×4, 5×6) off 100 balls. Murali was hit for 48 runs in six overs. Lance Klusener was unstopabble for South Africa. With three genuine all-rounders (Klusener, Pollock and Kallis), the Proteas were ideally suited to the English conditions. They seemed to be cruising in the tournament, but a Steve Waugh-inspired Australia had other plans. Pakistan, another team with three quality all-rounders (Abdur Razzaq, Azhar Mahmood and Wasim Akram), also had a wily spinner in Saqlain and an express tearaway in Shoaib Akhtar. But Mcgrath, Warne, Waugh and Co. proved to too hot to handle for the men in green. The final turned out to be an anti-climax as Australia steam-rolled Pakistan, winning by eight wickets. A young Indian team, led by a new captain, Saurav Ganguly, comprised of little known, but fearless players like Yuvraj Singh and Zaheer Khan. India was the team to watch with an ideal blend of young and experienced players (Sachin, Saurav and Kumble). They shocked Australia and then humbled South Africa in the semi-final. They were running away with the game in the final before they were hit by this thing called Chris Cairns. The burly, curly-haired all-rounder first bowled a frugal spell of 10-2-40-0 when the Indian openers were running away with the game. He then walked in at the fall of the third wicket and scored a belligerent unbeaten 102 to take the Black Caps to an unlikely victory. Shoaib Malik became the first player to be give out LBW by the third umpire in the inaugural game against Sri Lanka. By this time, India were on a roll. An aggressive skipper (Ganguly), a stable yet explosive batting line-up (Sachin, Saurav, Sehwag, Dravid) at the top,a young middle-order(Yuvraj, Kaif), quality spinners (Harbhajan, Kumble) and a good attack led by Zaheer. They had most things of what a good team should have. They were on the back of an amazing Natwest series win in England, where they beat the hosts by two wickets chasing 326. They were well and truly on the way to victory in the final after restricting Sri Lanka to under 250. Rain gods smiled on the hosts and saved their day. Ironically, the exact same thing happened the next day in the replay and India had to share the series with Sri Lanka. The World cup moved to the African continent for the first time. Only two teams could have stopped the Aussie juggernaut in the eight edition of the World cup. One was Pakistan (because they are Pakistan!) and the other was India, with its wealthy batting line-up. Pakistan, being Pakistan, were knocked out in the first round! The impressive Indian sprint was halted by the Aussies in the final. Ponting and Martyn made the most of a nervous Indian bowling line-up to post a mammoth 359 after India put Australia in to bat! Even desperate Indian prayers for rain, which was their last hope, were not answered and India was bowled out for 234. When Ian Bradshaw strode out to the center in the final, England had reduced West Indies to 147-8. By the time he came out, he and wicket-keeper Browne had put on 70 runs and West Indies surpassed Englands’ 217. An amazing victory, which unfortunately, turned out to be a flash in the pan rather than a West Indies revival. Contrary to expectation, this tournament was marked by low totals (forerunner to this world cup?). Teams defended scores of around 200 successfully. In one of the preliminary games, Jerome Taylor took a hat-trick, when the Aussies were chasing 225 for victory, to bowl West Indies to victory. Unfortunately for them, there was no such drama in the final. Australia bowled West Indies out for 116 and chased it down. The final will also be remembered for Ponting pushing the Indian chief guest off the stage during the presentation ceremony. The first World cup in the Carribean will, unfortunately, be remembered for the death of Bob Woolmer. India’s exit from the World cup in the first round meant that the viewership reduced drastically. None of this affected the Australians. They went on to hammer Sri Lanka in the final, thanks to a whirlwind 149 off 104 balls from Gilchrist. Ponting, Gilchrist and McGrath completed a hat-trick of World cups. India and Pakistan had a chance to revive themselves after first round exits in the World cup earlier that year. Revive themselves, they certainly did. In the first round encounter between the two teams, India won in a bowl-out after the two teams had tied. The final seemed to be heading to a similar result. Chasing 157 to win, Pakistan needed 12 to win off the last over. When the equation got down to six off four, Misbah attempted a ‘Marillier’ over short-fine-leg. He forgot that there is a Mallu in every corner of the world. Sreesanth took the catch and India won by five runs to send the nation into delirium. Pakistan was surrounded by all sorts of off-field controversies. Change of captains, players being threatened, match-fixing allegations, terrorist attacks on touring teams. It was typical of them to go on to win the second edition of the T20 World cup in such circumstances. Afridi was the hero for Pakistan, both with bat and the ball. The all-rounder hit an unbeaten half-century in the final to take them to an easy eight-wicket win over Sri Lanka. Ponting and Watson inspired Australia to yet another major trophy. Australia made a mockery of England’s 258 in the semi-final, winning by nine wickets. Watson and Ponting scored centuries to take their team home after England recovered through Tim Bresnan’s 80 to take them to 258. In the other semi-final, New Zealand beat Pakistan. Watson scored another century in the final to guide them to a six-wicket victory. Mike Hussey reminded everyone of the ‘Australianism’ to pull off an amazing come-from-behind victory in the semi-final over Pakistan. He hit Saeed Ajmal for 19 in the last over of the match to take the Aussies home. But, it was Collingwood’s England who had the last laugh, winning their first major trophy after beating Australia in the final. Man of the Series, Kevin Pieterson was in fine form. His 47 off 31 balls in the final helped England overhaul Australia’s 147.